COLUMBUS, Ohio, March 20, 2017 /PRNewswire/ -- The Ohio Caregiving Act proposed by AARP Ohio and passed by the Ohio General Assembly gives important new rights to millions of family caregivers and their loved ones officially becomes law today. The law, top priority legislation for AARP, will help Ohioans when their loved ones go into the hospital and as they transition home. Similar legislation enacted in Oklahoma resulted in significant reductions in healthcare costs and hospital readmissions. Ohio is the 35th state to pass a version of the AARP CARE (Caregiver Advise, Record, Enable) Act. The new act is designed improve communications between family caregivers and hospitals, reduce re-admissions and keep older Americans out of costly nursing homes. It will support the 1.4 million Ohioans who provide unpaid care to family and loved ones at any time. 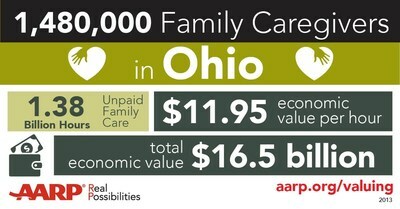 The value of this unpaid care in Ohio alone $16.5 billion a year. The new law, which ensures hospital patients' designated family caregivers are offered instruction in providing needed care at home, won unanimous support in both houses of the Legislature: 31-0 in the Senate and 95-0 in the House. Ohio is the 35th state to put a version of the AARP CARE (Caregiver Advise, Record, Enable) Act on the books. The law, which officially goes into effect today, will help as many as 1.4 million Ohioans who provide unpaid care to family and loved ones at any time. The value of this unpaid care in Ohio alone is estimated at $16.5 billion a year. More than 70 percent of Ohio caregivers also perform complex medical tasks – though only half receive training on how to do so when a loved one leaves the hospital. Ohio voters aged 50 and older overwhelmingly support the bill, with 92% saying hospitals should "explain and demonstrate" to family caregivers medical tasks they'll have to perform when their loved ones are sent home from the hospital, a 2014 AARP survey found. This act makes this a requirement. "This is a great day for family caregivers across Ohio who are doing all they can to help their loved ones live at home for as long as possible," said Barbara Sykes, State Director of AARP in Ohio. "Senator Lehner, Representative LaTourette and all of our lawmakers are making a real and positive difference in the lives of millions in passing this bill." "Information is power, and the Ohio Caregiving Act will empower millions of family caregivers." Designate a family caregiver in the patient's medical record. 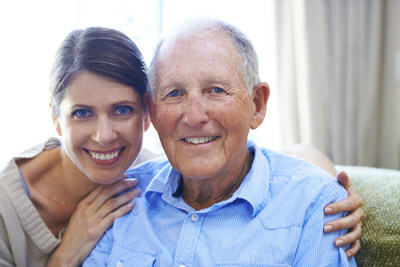 Inform the family caregiver when the patient is to be discharged. Offer the family caregiver instruction and demonstrations of medical tasks they will be expected to provide for their loved ones at home, such as administering multiple medications, dressing wounds and operating medical equipment. "The Ohio Caregiving Act recognizes the critical role family caregivers play in keeping their loved ones out of costly institutions. It utilizes the existing hospital discharge process to put in place some small, but meaningful supports for caregivers during hospital transitions, a difficult and stressful time for both patients and caregivers," said Senator Peggy Lehner of Kettering, one of the co-sponsors of the new law. "Family caregivers are already the 'new normal' and have become the default providers for complex chronic care in home. I myself have been in this very situation," said co-sponsor Representative Sarah LaTourette from Bainbridge Township. "As Ohio's population ages, this normal will become even more critical and it will become incumbent to keep family caregivers better informed, notified, and instructed in after-care tasks, so that they have a better chance to keep their loved ones safely at home." "I was not in the ER observation unit to advocate for my Mom when it was most needed, and they were going to send her on her way into the cold with a 'follow up' appointment and some pills she couldn't swallow," said Andrea Tayek of Shaker Heights, who cares for her mother Marcia. "Now that won't happen. Family caregivers like me will be engaged at the start and allowed to play a key role in the medical care of their loved ones." "This law is a perfect example of how common sense solutions can be found when stakeholders work together," said State Advocacy lead for AARP Ohio, Trey Addison. "Family caregivers will be given crucial guidance on how to care for their loved ones after leaving the hospital and help older Ohioans avoid nursing homes and other institutional care. We commend our state lawmakers for working with us on this new rule to recognize the vital role caregivers play in the health of those who rely upon their care."